Previous post: Christmas Craftapalooza at Yoshi Now! I have very limited memories of pie from my childhood. In my family, fruit was mostly consumed as a dessert or snack, always in its raw form, and never cooked. Pie was something I associated with my Strawberry Shortcake Atari game where I had to avoid the bad guy, the Purple Pie Man. I discovered Marie Callender’s pies sometime during high school and I became addicted to their Fresh Strawberry pie. When I moved to New York, when people talked about what to do for dinner, they would talk about ordering a pie. I was confused at first, until I realized that they meant a pizza pie. In California, we just called it a pizza. Since then, my pie palette has been opened up to different cultures. Spinach pie, meat pies, quiches, shepherd’s pie, and more. Now when I receive an invitation to a holiday meal, I wonder if there will be pie. I usually ask, because if pie is not being provided, then I’ll bring one. Baking one is out of the question since the pie crust, assembly, and baking of it requires some patience and expertise, and I don’t have that within me. I do, however, know where to buy pies. Although it may sound a bit generic, Costco makes pretty darn good pies. Not to mention that they are at least twice the size of anybody’s face. There are a couple of places in New York to get savory pies: Pie Face, Tuck Shop, and The Little Pie Company. Momofuku used to be my go-to, but now sweet pies are more abundant in NYC. Tons of pie shops are springing up in Brooklyn. Brooklyn is a bit out of my way, so on the recommendation of foodie Henry Cheng, I tried Petee’s Pie Company on the Lower East Side. Let me tell you, this pie is worth skipping out on other outings. It beats going to a bar or any fancy dessert bar. It’s my top pick right now. Petee’s Pies have perfectly buttery crusts, not to mention that they are made with organic ingredients. That woman knows how to bake the perfect pies! I’m not sure why I only let myself eat pie around the holidays. I should make it a year-round tradition! Pumpkin pie on other days besides Thanksgiving and Christmas would be a really great way to get vitamins A and B into my diet! 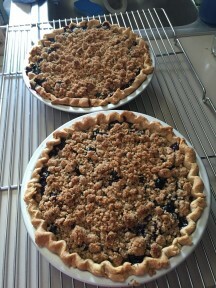 I am including recipes for a savory pie and a sweet pie. 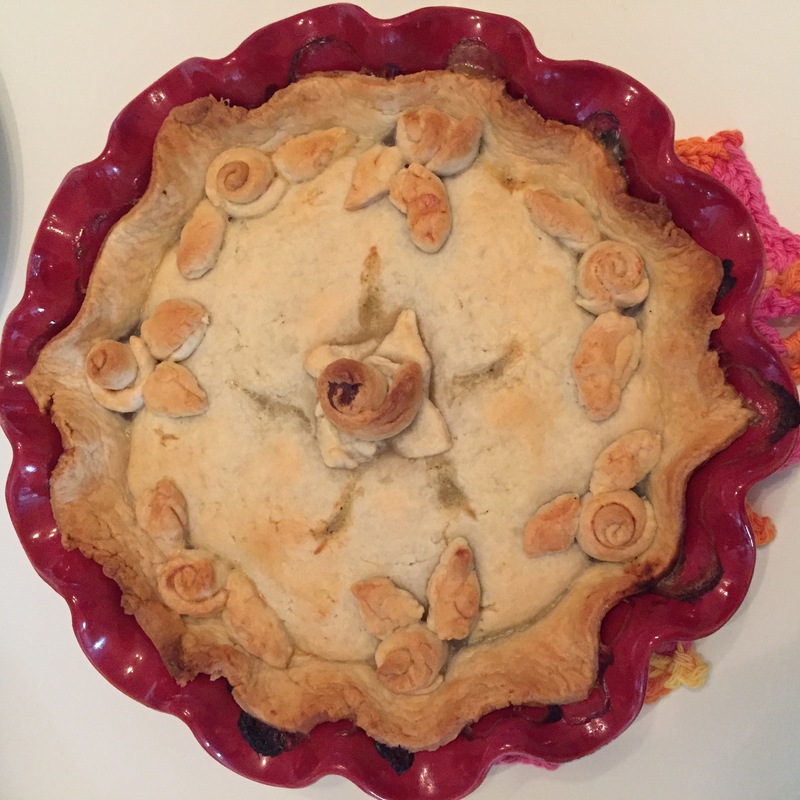 The savory pie comes from Lea Leong Ringler of Cookin’ With Whatcha Got. This pie would make any holiday or festive event memorable. 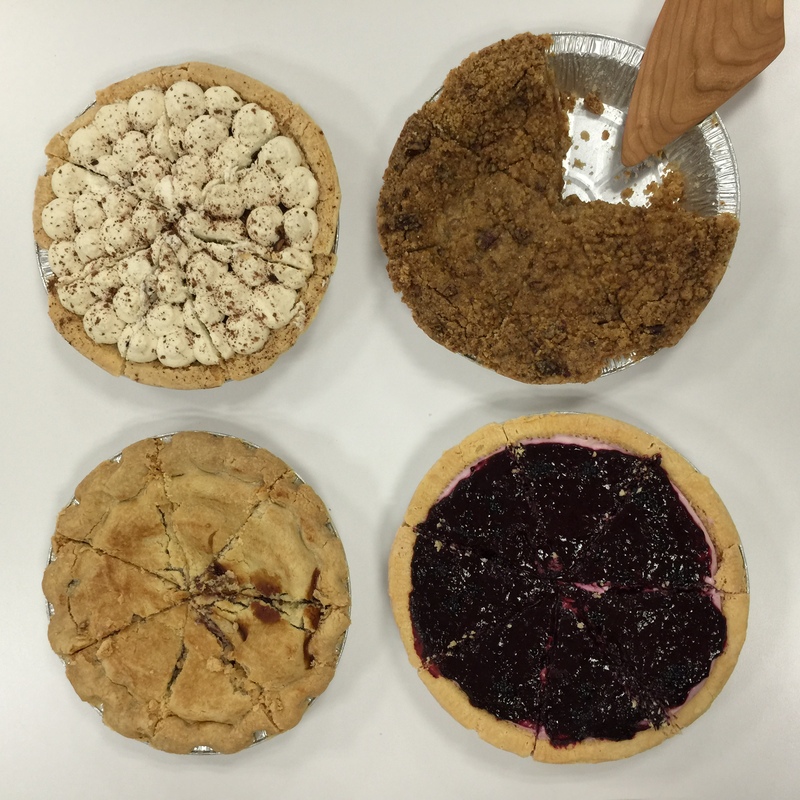 The sweet pie comes from my coworker, Joshua Arfer, who makes a magical blueberry pie. He’s a good version of a Purple Pie Man. Lea Leong Ringler: Living in England, we’ve quickly been introduced to the amazing variety of savory pies. As the autumn and winter months come, nothing is more comforting than a warm, hearty pie topped with flaky pastry. I make it easy and use store-bought pastry dough. It’s a simple dish made in one pot (transferred to a pie dish for baking), which can be modified with the vegetables that you have in your fridge. Spray a pie dish with cooking spray. Preheat oven to 375F. Boil potatoes in water until tender. Add olive oil to large pan, brown the chicken, then add leeks, garlic, carrots, and herbs. Add butter to pan, then stir in flour. Let cook for one minute. Continue stirring and add chicken broth and milk. Let the mixture thicken. Drain and add potatoes to chicken mixture. Add salt and pepper. Pour the mixture into the pie dish. Top with pastry, sealing the edges and cutting slits in the center in order to let steam escape. Use extra pastry to decorate the top. Brush pastry with milk. 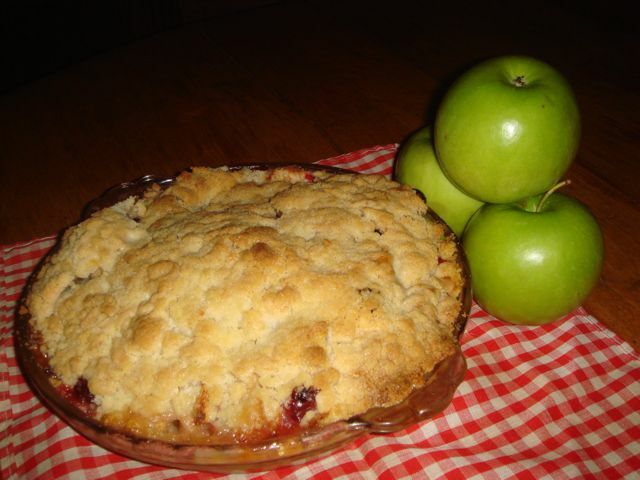 Bake pie for 45-50 minutes or until the pastry is golden brown. Let cool for 15 minutes. Serve warm. On a lightly floured work surface, roll out one disk of dough to a 12-inch round. 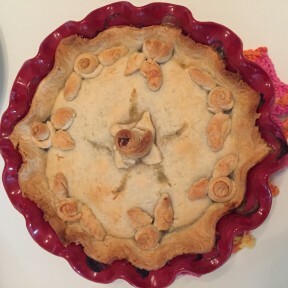 With a dry pastry brush, sweep off excess flour; fit dough into a 9-inch glass pie plate, pressing it into the edges. Trim dough to a 1/2-inch overhang all around. Fold edge of dough over or under. Chill pie shell until firm, about 30 minutes. Refrigerate pie until firm, about 30 minutes. Meanwhile, preheat oven to 400 degrees, with rack in lower third. In a bowl, mix 1-1/2 cups flour, 3/4 cup light-brown sugar, 1/3 cup granulated sugar, and 1/4 teaspoon each salt and cinnamon. Cut 1-1/2 sticks chilled unsalted butter into pieces. With your hands, work in butter pieces, until large clumps form. Divide mixture in half; freeze in plastic storage bags. Check out Alicia’s past columns in our Food section. You can follow Alicia on Twitter @AliciaJLieu. Alicia Lieu grew up in Cupertino, California. She has Master’s Degree in Music Composition from the San Francisco Conservatory of Music and Bachelor of Art from UC Santa Barbara. A New Yorker with the heart of a Californian, she currently resides in Queens, NY and blogs about food in Life is Delicious.